The last two weeks have been so full of sickness! On the 5th Zeke's eyes started looking irritated but I thought maybe he'd just poked it or rubbed it too much, something like that. The next day, he woke up and couldn't see - his eyes were sealed shut with crusty stuff. After we cleaned his eyes up, they continued to stream yucky goopy looking stuff. Hubby took him to a local walk-in clinic and got the brush off from a hurried nurse practitioner - their official diagnosis was allergic conjunctivitis and they prescribed outrageously expensive antihistamine eye drops. A few short days later, Ellie developed the same symptoms. We made the trek back to the walk-in clinic and she was seen by a doctor who took plenty of time checking her out and diagnosed her with bacterial conjunctivitis. (So apparently Zeke's wasn't just caused by allergies...) Hubby and I have also been sick on and off - coughs and sinus stuff, some mild fevers, aches, etc. We are *hopefully* on the mend and are all definitely ready to get out of the house! *Having said that though, I woke up this morning barely able to talk...so we shall see what happens. We've schooled on and off. Even though the kids have been sick, they haven't really been "sick." I've just mainly had to keep wiping their eyes & faces every hour or so...it hasn't stopped them from running around any less, that's for sure! In this picture, they were playing with flashcards. We have several different neat sets - this one was on all types of animals. They were trying to sort the animals into "groups" like bugs, farm animals, etc. Not a lot! I've been trying to keep the kids home so our sickness doesn't spread anymore. Consequently, we've all got a bit of cabin fever. Zeke has missed going to our homeschool co-op and some play-dates he had scheduled with friends. Hopefully this coming week will be better. We have some makeup play-dates scheduled and we'll hopefully be going on a very fun field trip with Gramma (my Mom) later on in the week. 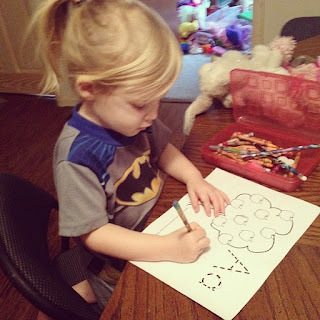 Ellie started the Letter of the Week preschool curriculum from Confessions of a Homeschooler and she's enjoying it. She's really been wanting to "do school" like her big brother and likes having her own special activities. This past week was all about the letter A. Rearranging our school area, working on sensory bins/boxes and developing some busy bags for Ellie. 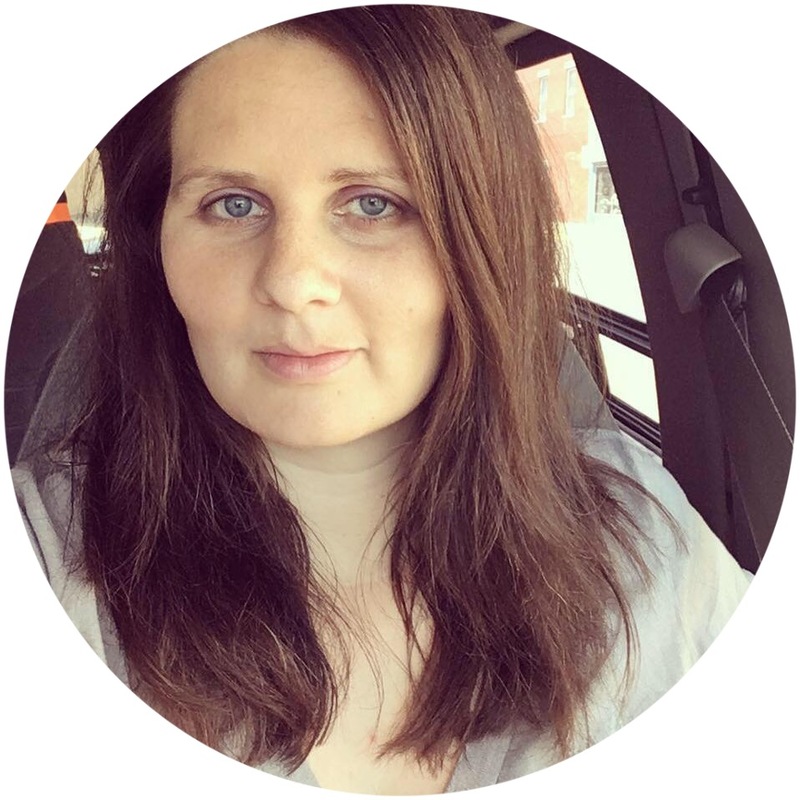 I won a copy of "The Good Wife's Guide: Embracing Your Role as a Help-Meet" from Time-Warp Wife's blog! I just started reading it yesterday and it is sooo good! 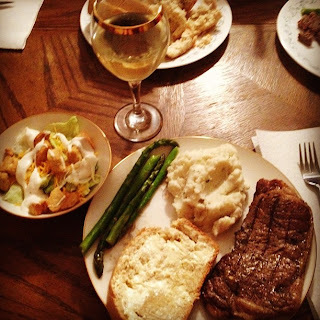 Hubby & I cooked a delicious Valentine's dinner. (Well, he did most of it...I just helped a little.) He invited his grandmother down who is a widow and we had a nice evening, visiting and chatting. Hubby got a beautiful real wood cabinet/entertainment center at an auction for $15. 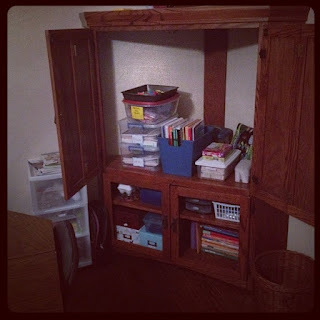 I had a smaller cabinet I was using to store our homeschool stuff and this one is going to work out SO much better. Everything has a place in it. I am so grateful that he is the deal-meister! A sickly - but still sweet - sleeping Ellie! Your V-day dinner looks so yummy! I guess you are lucky twice first for the children and second for getting the blog name. When we have smart and adorable kids Life sure would be Wonderfull and chaotic.. isnd't!! !